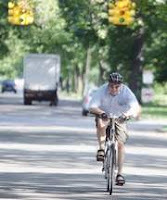 “High gas prices have justified my buying a new bike,” said Steve Roach, a lawyer who commutes from Grosse Pointe Park to the downtown Detroit offices of Miller, Canfield, Paddock and Stone. Usually I leave the realm of local food and agriculture to the far more talented and prolific Ali over at the Cleaner Plate Club, but I feel the need to spread the word about something really cool happening just up the road in Pownal. Two Spoon Farm is a brand new operation just off of Carpenter Hill Rd in North Pownal, VT run by Angela and Brian McGinness. They are raising chickens, beef, pork and lamb on about 35 leased acres of gorgeous reclaimed farmland. What makes this farm truly special is that they are attempting to run it as a CSA (Community Supported Agriculture) much like the very popular, vegetable oriented Caretaker Farm in Williamstown and the lesser known, but absolutely incredible Mighty Food Farm in Pownal. More importantly, they are doing everything right from a health and environmental point of view. All the animals are free range. The cattle are grass-only fed. The pigs are given a few acres of wooded land to root around. The chickens get to trot across an open pen and develop their muscles which leads to one of the best tasting birds you can imagine. There are absolutely no hormones or antibiotics given to these animals. The only outside food is grain for the chickens and pigs who quickly process it right into the eco-system if the pasture. I've seen a lot farms and processing plants in my years in the food biz. I've never experienced one that has the complete integrity, from start to finished product, of Two Spoons. The place really could be a chapter in one of Michael Pollan's books. Angie and Brian are constantly moving the temporary fencing used to corral the animals. This allows the chickens to scratch and "fertilize" the ground plot by plot. Within a few weeks the areas that chickens have previously roamed are full of incredibly lush green grasses and meadow plants that just happen to be the favorite food of the steers. These cattle then devour and tramp the pasture down to the point where the sheep can come in and clip the lower lying grasses that make up most of their diet, which leaves the vegetation low enough for the chickens to come back to their starting plots and keep the rotation going. I'm not going to try and kid anybody. Meat of this quality is not cheap, but the gap between the prices of farms like Two Spoons and conventional factory-raised meat is narrowing with the rise in grain and oil prices. It costs a lot of money to haul a pound of refrigerated dead cow from Nebraska to New England. I should also mention that by buying this local product you are directly supporting a young family living in your own backyard. The profits aren't being sucked up by Wall Street. It is also "clean" food, free of the various suspect elements found in your average supermarket meat section. And did I mention that it is as good a chicken as I have ever tasted. Seriously. After walking the pasture at Two Spoon with approximately 70 locals this afternoon, it is my sincere belief that this particular enterprise will explode in the next year or so. If you want to get in on this remarkable little corner of our world, I would suggest buying shares in your desired meats ASAP. Angie and Brian can be reached at 802-823-7308 and at twospoonfarm@hotmail.com. Even couples planning a wedding at the Plaza Hotel in New York City can jump on the local food train. For as little as $72 a person, they can offer guests a “100-mile menu” of food from the caterer’s farm and neighboring fields in upstate New York. Fashions come and fashions go. Less globalization of our food supply is a great thing with many obvious, and even more not-so-evident, benefits. but framing this notion in terms of fashion opens it to charges of elitism. And that is incredibly damaging to something that makes incredible sense for society and, in particular, our little corner of rural New England. Of course the wealthy can afford to treat food as luxury. They always have. Seared Fios Gras is "fashion." A tomato from Pownal or a zucchini from my garden is not and should not be cast as luxurious. The working classes have always had to struggle a bit to put food on the table. This has been true throughout history. A lot of really good commercials for the Democrats, that's what. For once I agree with Mitt. Could growing fresh vegetables help save crumbling inner cities around the world and tackle hunger? That is the ambitious aim of a charity called Urban Farming, which has its headquarters in Detroit, the capital of the US's wilting car industry. The idea is very simple: turn wasteland into free vegetable gardens and feed the poor people who live nearby. Demand for land to grow food, fuel crops and wood is set to outstrip supply, leading to the probable destruction of forests, a report warns. Sigh. My old hometown does, indeed, look like a barren wasteland in most many neighborhoods. The decline of Detroit is one of saddest stories in America. I hope that my in my son's lifetime the city will return to the glory it had in my parent's days. For my generation it has been all but lost. "It's all about the hair. Hair speaks volumes about every politician's wife. And I think you'll be impressed with my version of Laura Bush's very Republican hair." Maybe Glenn can get his Theater Critic, Ralph, who used to be Elizabeth's drama teacher at PHS, to score an interview. Former LA Prosecutor Vincent Bugliosi has a book at #14 on the best sellers list of the NYTimes. You would never know that based up on the lack of media attention. This rings all too true, but it is something I simply don't wholly understand. It explains a myriad of journalistic sins, from Iraq to slanted coverage of Al Gore's 2000 campaign. Why are they afraid? Ratings? Circulation? Corporate ownership? None of this adequately explains why our national press is a bunch of spaghetti-spined wimps in the face of the rabid-right. I don't get it. Guns were the issue. But words and federal lawsuits became the weapons of choice Tuesday as Atlanta officials declared Hartsfield-Jackson International Airport a "gun-free zone," and gun advocates immediately retaliated by suing them. The fight about a new state law — one that permits licensed gun owners to carry concealed weapons in more public places — began at Atlanta's city-run airport, the world's busiest with 89 million passengers a year. Bearden, a former policeman who authored the new law, said Monday he would come to the airport on Tuesday to pick up relatives and would be carrying a permitted concealed weapon. DeCosta vowed to have him arrested if he did. By Tuesday, Bearden had decided to let the courts decide the issue. "That showdown will take place in the courts instead of an airport parking lot," said Bearden, who still planned to go to the airport, but without a gun. The lawsuit accuses city officials of violating Bearden's civil rights by threatening him with arrest. Don't ever be fooled. The so-called "gun rights" zealots are not reasonable people. I'm not referring to those of us who think that gun ownership is a perfectly fine thing, but rather to those who somehow think that flooding the streets (and airports and who knows where else) with gun-toting Clint Eastwood wanna-bes is the most effective answer to crime. Those folks are a couple of rounds short of a full magazine. On a related note, good luck to Wes, who has accepted a new job and is moving to .... Atlanta! Have fun Buddy! You've got your work cut out for you down there.